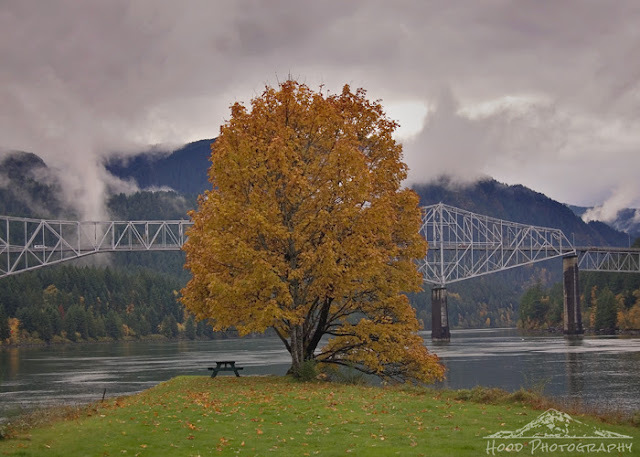 Connecting Oregon and Washington between Cascade Locks and Stevenson, the Bridge of the Gods is one of my very favorite locations to photograph. The bridge itself is pretty outstanding, but to make things even more impressive, it is surrounded by the amazing Columbia River Gorge. I took this photo on a very soggy autumn day from the westernmost point of Thunder Island. Doesn't the picnic table offer a most peaceful looking spot to take in the views? What a pretty scene with the lovely tree and colors and the beautiful bridge. Great shot. Happy Skywatching, enjoy your weekend! Ah, the perfect picture of Autumn at its best!! Superb!! Thanks as always for sharing the beauty!! Having the table there reinforces how big that tree is! What a beauty of a tree, and it really stands out against the gray sky. Have a great weekend! I have a solitary tree that I like to photograph each autumn. This year I missed the opportunity and I am truly disappointed with myself. Very nice image that you have here. Well done. Have a blessed week-end. Love the tree and the picnic table underneath. I can see photoshoots here. Lovely atmospheric shot! It works even though the subject is right in the middle of the shot. What a beautiful view. Love the autumn leafed tree centre stage and framed by the bridge design. Love that bridge! Made many trips from Eugene Oregon to Clarkston Washington where our families lived. This bridge was where we looked forward to a break from the road. That sure is a gorgeous scene. The Autumn tree really sets it off nicely & the picnic table looks so inviting for a relaxing weekend picnic. I had a bridge for my Scenic Weekends post too. This is a beautiful scenic picture. The tree is beautiful filled with fat color.